Baseball's back and so is the 2014 Topps Spring Fever promotion. Those who visit a participating shop between Monday, March 31 and Sunday, April 6 can get a pack of exclusive cards. Shop for 2014 Topps Spring Fever cards on eBay. To get a pack of five cards, collectors must visit a shop that's doing the promotion and purchase either 16 or 18 packs. Topps' Facebook page and Twitter feed say 16, material sent to dealers says 18. 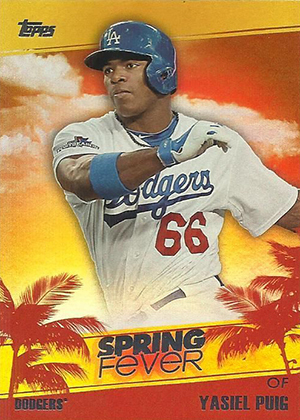 The 2014 Topps Spring Fever set has a total of 50 cards. As one might suspect, it features the top players in the game today. The cards are bright and colorful. They're also likely to be the only baseball cards to feature palm trees this year. Autographs are randomly inserted in packs. These mix current players and retired stars. They're numbered but cover a wide range from as high as 600 to a low of less than 10. There are a total of 29 different autographs. The 2014 Topps Spring Fever promotion has had a little confusion. Initially packs of 2014 Topps Series 1 Baseball were going to have redemption cards good for a pack of the cards. It still required a trip to a participating shop. Those redemption cards never showed up. Instead there's the purchase requirement. As with every hobby shop promotion, it's always a good idea to call ahead to see if your local shop is a) participating and b) they still have packs in stock. guess ill wait to buy my series 1 next year.. I talked to my one of my LCS managers a couple days ago and he said Topps told them at the Industry Summit as long as the promotion was used to promote Topps products that store owners could give out packs for buying any Topps product not just Series 1. It was up to them.